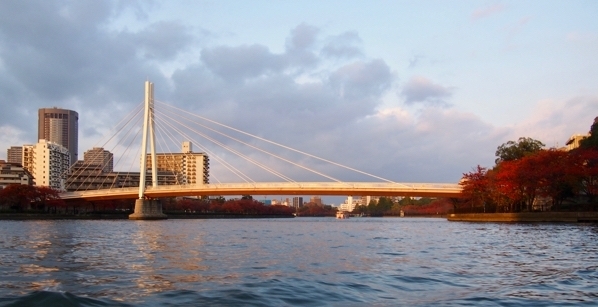 My love affair with Osaka, Japan’s “other” city, stretches back fifteen years already. 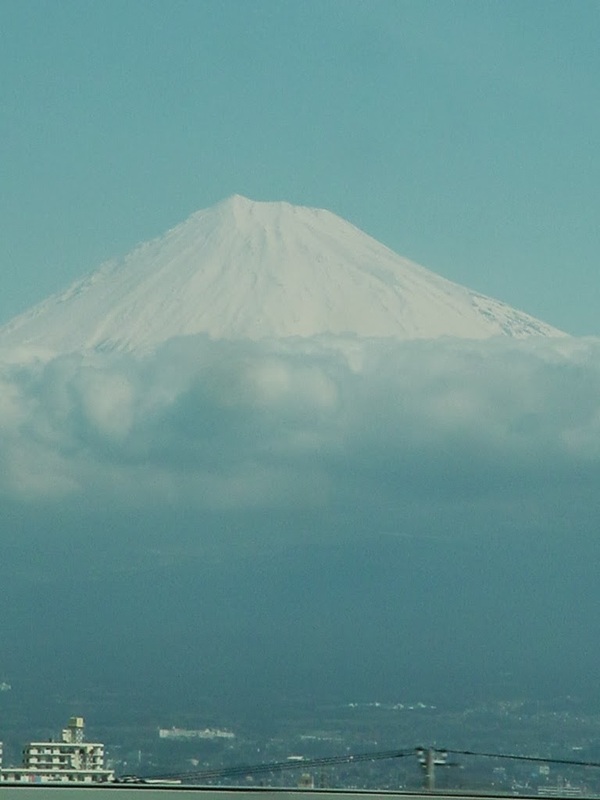 As a 25-year-old I headed to Japan to teach English with my then boyfriend. The company which hired us only offered two destination choices to teachers hired in couples: Tokyo or Osaka. Always one to make the less obvious choice, I instantly said Osaka, without even researching anything about it. 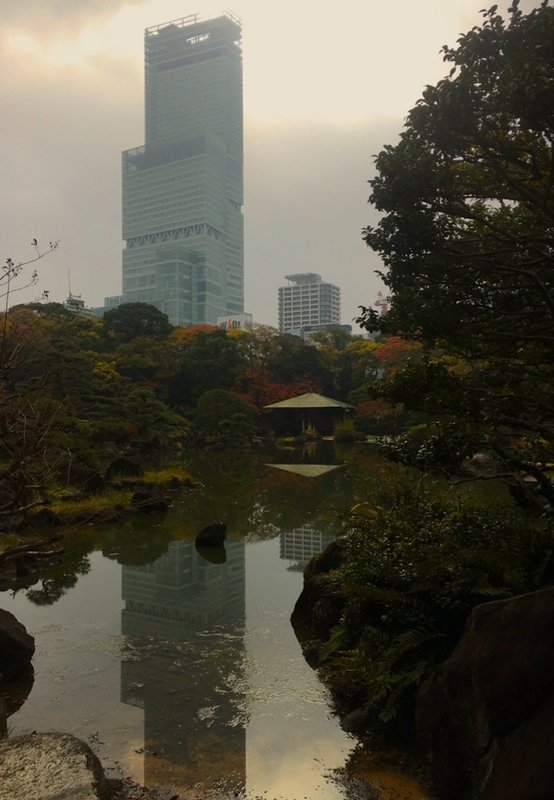 Of course, I was right, and Osaka is the absolutely best part of Japan, there are masses of fabulous things to do in Osaka – and I’m not biased at all! But why, you might ask? 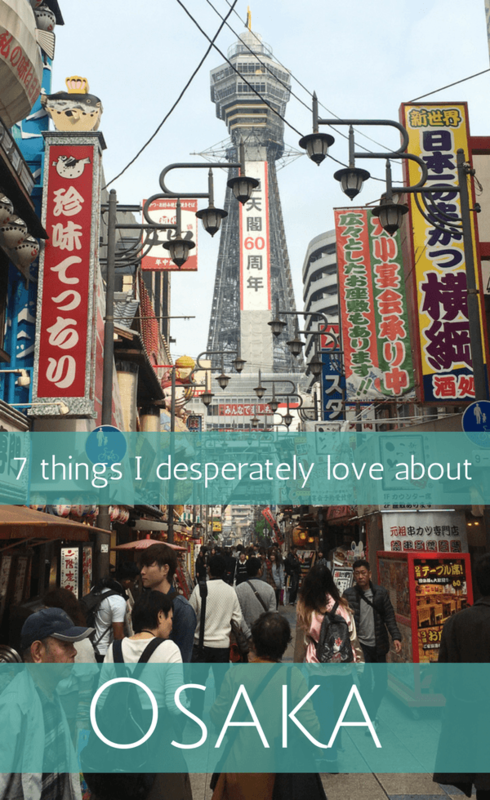 There are dozens of reasons, but today I am settling on seven things I desperately love about Osaka and think you might too. 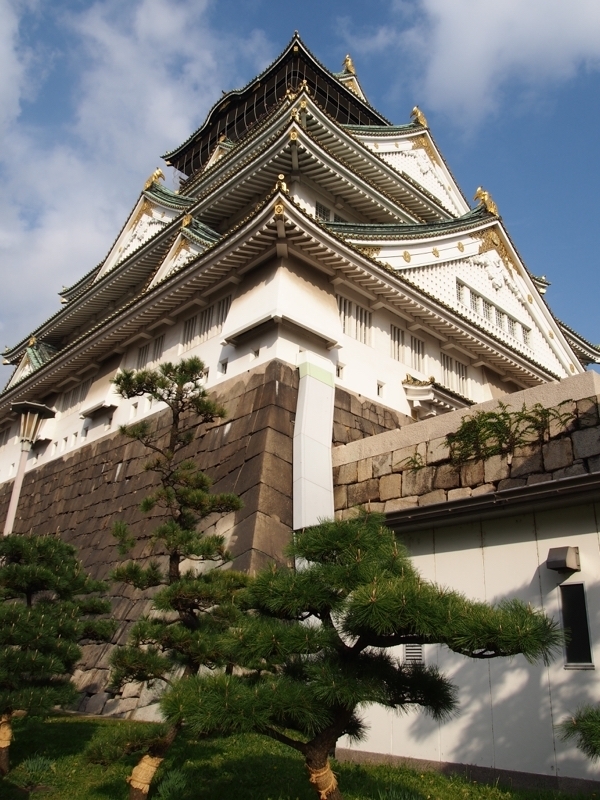 Every big city has its iconic attraction and Osaka Castle is a well-deserved Osaka sightseeing highlight. 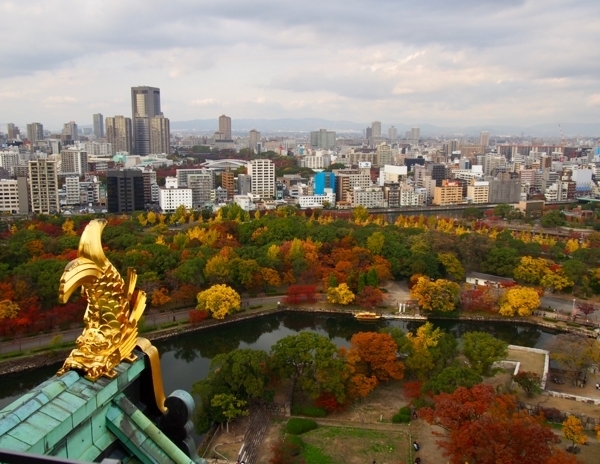 Of all the places to visit in Osaka, I have visited Osaka Castle more than anywhere else, with cherry blossom blooming, with snow falling, with autumn leaves framing it. I still love it, and I love the Osaka Castle Park that surrounds it. Osaka Castle itself has a mixed history and it must be said that what you see today is not the original 1583 castle; then again, almost no castles in Japan are still around in their original form. That’s history for you! It’s been destroyed several times by fire (both on purpose and by accident) and the current building was reconstructed in the 1930s. Not only do you get the impressive view of the castle as you approach it, but within the castle there’s a history museum – I have long loved the hologram-diorama displays explaining the castle’s history, sadly only in Japanese but they’re so unique I always stare for ages! 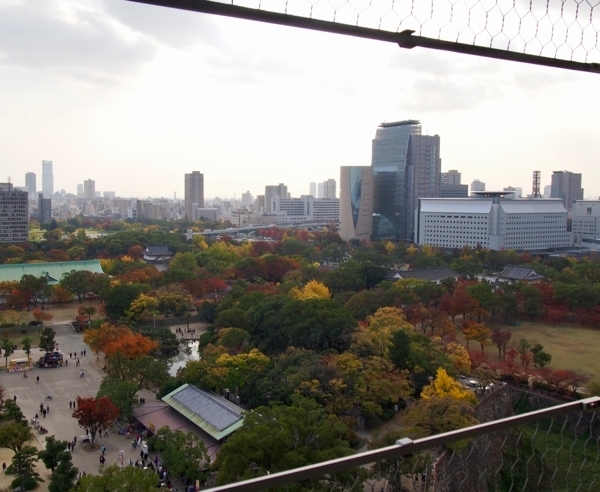 The best part of Osaka Castle, though, is the observation deck on the eighth floor, where you get a great view over Osaka Castle Park and beyond, and that’s when going in either spring or autumn (this trip, I got the gorgeous autumn leaf effect) is particularly smart. There’s always lots happening in Osaka Castle Park, even if you just want to do some people-watching (I watched a woman wash her dog’s feet then strap him onto her front in a baby carrier, then ride off on her bicycle). One of my fondest memories is the time I watched them break the world record for the largest okonomiyaki ever made – I even got to taste it! On this recent trip, I also got to take the Aqualiner boat cruise which leaves from adjacent to Osaka Castle Park. It’s a boat similar to the canal boats you’d see in Amsterdam, and it was a really great alternative way to explore some more of Osaka. Plus they demonstrate how the roof of the boat goes up and down and that’s pretty cool! Oh goodness, what to eat in Osaka!! Each time I think about Osaka’s array of foods I sigh and my mouth waters. Literally. As far as I’m concerned, there is no better place in the world to eat. And I miss it horribly! It’s almost hard to know where to start to tell you about it, and to be honest, you should just start walking through the centre of Osaka in any direction, turn into a restaurant and eat. The next day, go to the next one along, and it’ll be totally different and equally amazing. But an absolute must-eat is okonomiyaki, which is often described as a cabbage pancake but that doesn’t do it any justice at all, because it’s the most delicious food in the world! Just try it and trust me. Very proud of my self-made sushi! 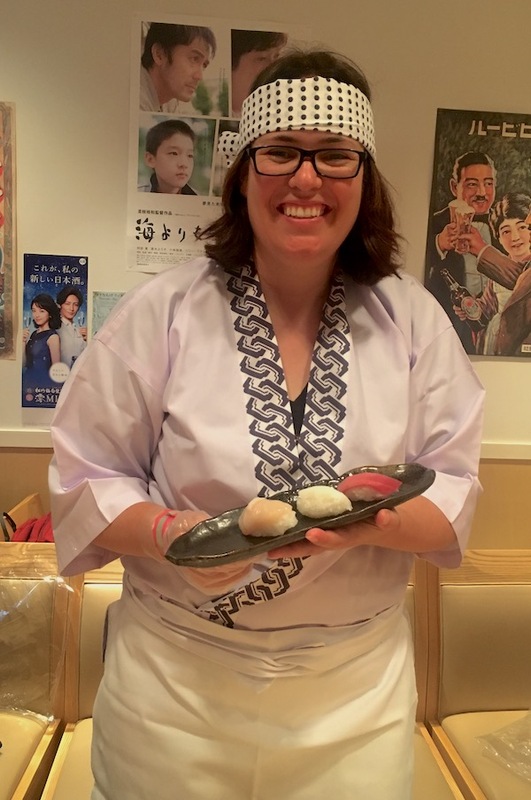 On my recent trip, I also had a very cool experience being taught how to properly make sushi. As well as learning how to cut seafood properly, I was taught about the rice and adding the right amount of wasabi and making it all look beautiful and … well, mine fell apart a little on eating but it sure tasted amazing! Of the many things to do in Osaka, especially the stomach-related ones, I highly recommend finding a sushi-making course. 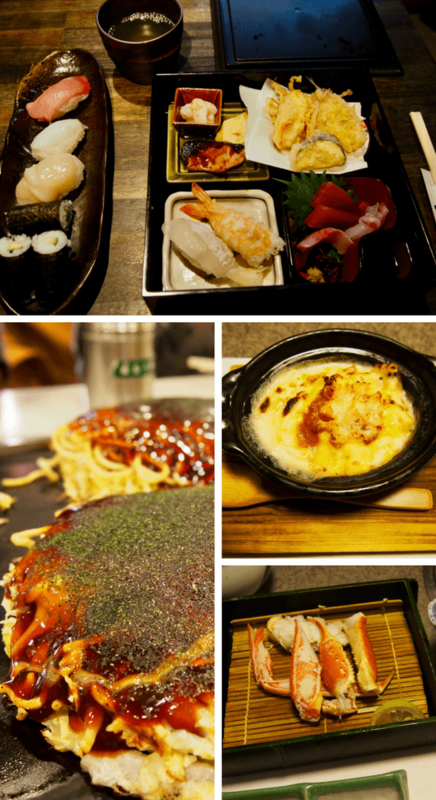 Osakan food, clockwise from the top: sushi, crab gratin, more crab, okonomiyaki (modan-yaki style with noodles). All delicious. When you walk around central Osaka you’ll also see a couple of enormous mechanical crabs waving their legs around on top of restaurant entrances, and I would encourage you to go inside! We had a multi-course crab-related meal at Kani Doraku, one of the famous crab-eating spots (and they now have restaurants outside Osaka too – but don’t imagine at all they’re like some fast food franchise, very far from it!). From the window of our private room (I love that way of eating in Japan!) we could look down over the Dotonbori bridge area and watch the evening cruise boats go by. A perfect night (one of many in Japan, to be honest!). I have a sentimental attachment to Osaka’s Kaiyukan aquarium after taking plenty of visitors there during the two years I lived in Japan; I also remember a special farewell trip with a couple of my Japanese friends just before I moved away. 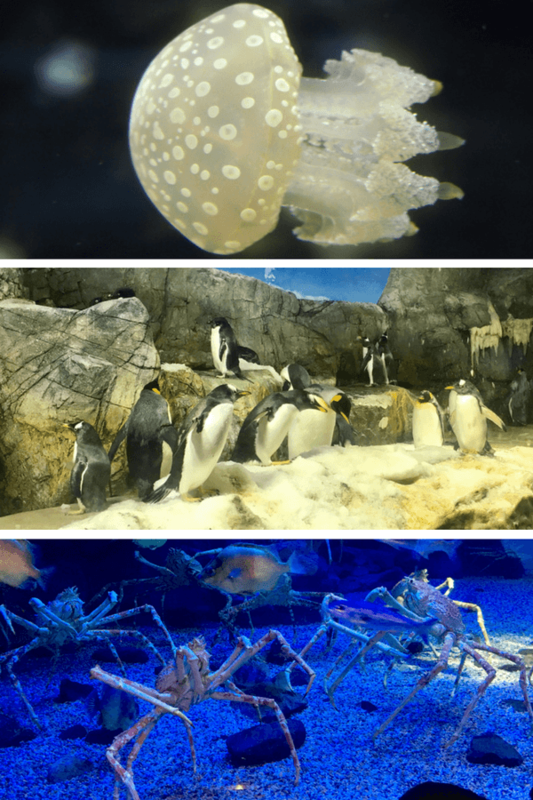 But that aside, it’s a really impressive aquarium and one of several places to go in Osaka that I regularly recommend. You start at the top (after riding several escalators), above the water (there are otters!!!) and then spiral your way down past different displays, ever deeper, until you end up at the deep sea exhibition with its scary giant spider crabs. Along the way are penguins and dolphins and whale sharks and squid and so much more. Kaiyukan is part of a larger area on the water called the Tempozan Harbor Village (incidentally, you can get a boat here from Universal Studios which might be a good travel-with-kids option if you’re staying in one of the Universal City hotels). Tempozan has shops (and this time round, it was the first time I got to go 100-yen shopping!) and it also has a Legoland Discovery Centre (kids!) with a pick-a-brick wall (adult Lego fans!). AND there is an enormous ferris wheel, which I was told was briefly the largest ferris wheel in the world but someone else built a bigger one shortly after the Tempozan one was finished. This is the heart of Osaka for me. 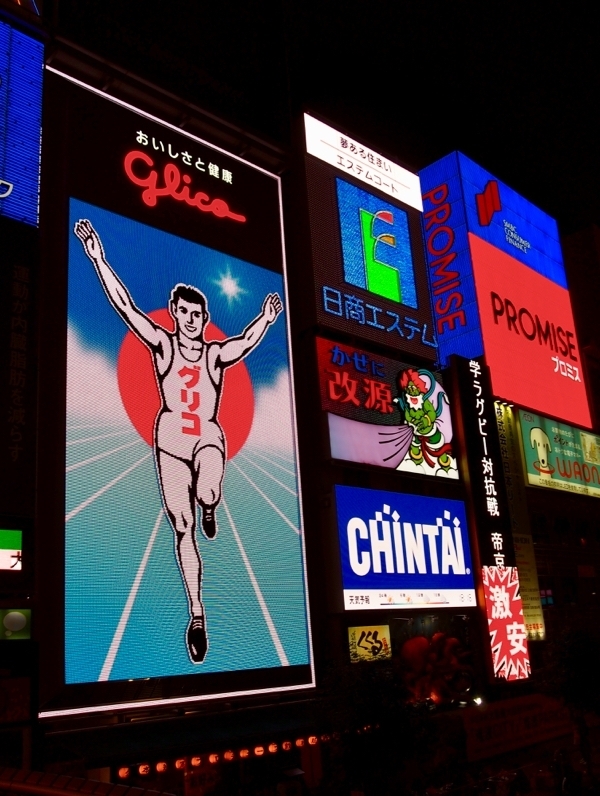 Dotonbori Bridge and the neons including the famous Glico Man might be the stereotypical photograph you’ll see of Osaka points of interest but it’s stereotypical for a reason. This is where all the people are. This is where it feels like you’re really in the middle of Osaka. It is atmosphere plus!! And my heart leapt when I reached this bridge again on this trip. Give me the Glico Man over the Eiffel Tower any day. 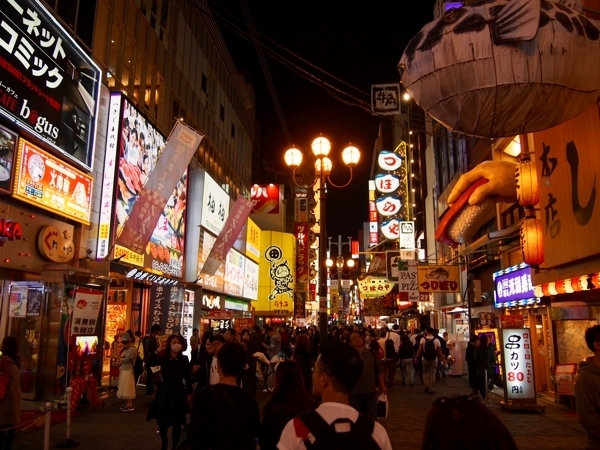 The Dotonbori bridge comes at the end of the Shinsaibashi shopping street. This place is heaven. I’m not a huge shopper by any means – I’m not into clothes or shoes or makeup or anything, I don’t buy tonnes of stuff anywhere – but shopping in Japan is something quite different. This time I came away with lots of small gifts for friends back home (including my fellow Hello-Kitty-loving friend! ), some kitchenware (we are eating our morning muesli out of Japanese bowls every day now), new chopsticks to replace those I’ve been using for 13 years!, stationery, calendars (all of that kind of stuff is just so cute in Japan), Japanese snacks and unusual confectionery, and more. Central Osaka is full of all kinds of shops, for all kinds of purposes, and to be honest, a good serious wander around will probably yield the best results and the most fun. There are 100-yen stores like Daiso (so everything costs a dollar-ish – but in general the quality is massively higher than our comparable $2 shops here in Australia); there are sidestreets devoted to different kinds of products, like pots and pans, or fabric, or clothing, or even an area full of shops selling the plastic food you see in restaurant windows here. 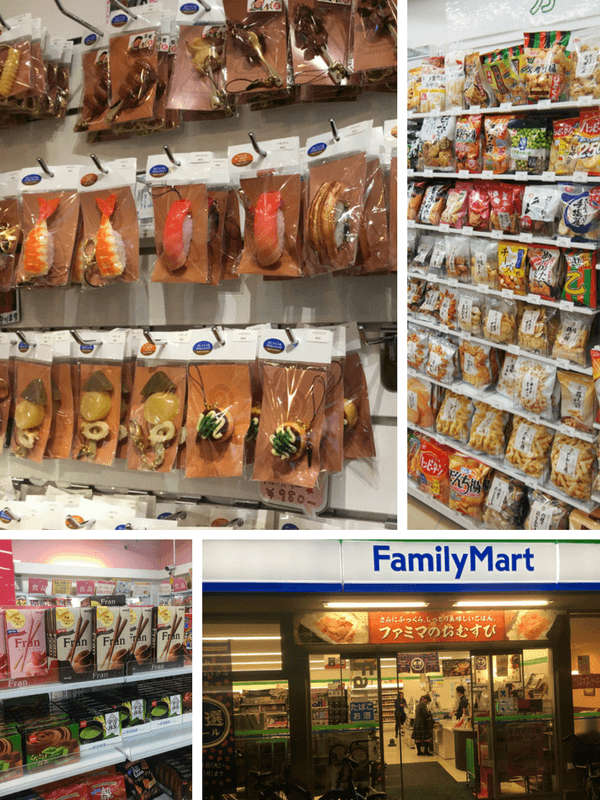 At regular intervals you’ll find convenience stores like Lawson, FamilyMart, Sunkus and more – they are home to an always-intriguing array of items and I love them for their Japanese snacks, like the onigiri triangles of rice wrapped in seaweed, and all kinds of Japanese confectionery. I could go on, but I’d get too sad about not being able to go shopping in Japan again tomorrow so I’ll leave it there! When I lived in Osaka, it was the Umeda Sky Building that we were always directed to for a big view over the city. It’s still one of the best things to do in Osaka and is a really unusual building, with escalators crossing from tower to tower right up high. Eiffel-Tower-esque Tsutenkaku is another tower worth checking out and particularly so because the Shinsekai area it’s in is so full of life – crazily colourful bars and restaurants and pachinko parlours. But in recent years, there’s a new “big tower” in town, the Abeno Harukas 300 building, which I got to check out this time. 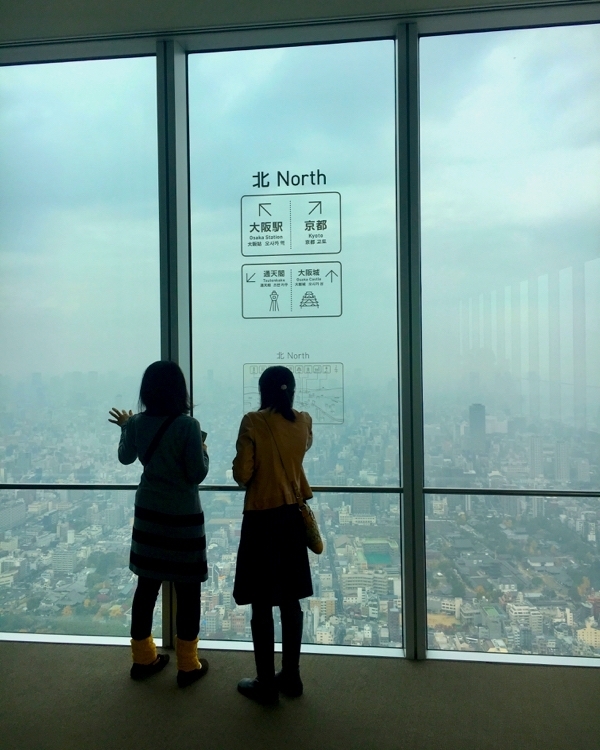 You might guess from its name that it’s 300 metres tall, and it’s partly filled with a department store and a luxury hotel, but the top section is for people wanting to see over Osaka, from the tallest building in Japan, no less. The Abeno Harukas building, like so many things in Japan, has its own cute mascot, in this case the Abeno bear – a blue bear covered in white clouds, since he lives up there so close to the sky! Such a Japanese thing! You know I’m completely biased and love Osaka over Tokyo, and because of that I’m completely vulnerable to believing whatever I’m told that makes Osaka better than Tokyo. (Full disclosure, in my lifetime I’ve spent a total of less than a week in Tokyo – I totally shouldn’t judge!) In any case, I hear that Osakan people are more friendly and funny than their Tokyo counterparts, and I can certainly vouch for them being friendly (well, and funny, actually, and I know Osaka is known as the comedian’s capital of Japan). It was so wonderful to take this Osaka trip and hear the way they talk (they have a slight dialect, Osaka-ben, but having learnt my Japanese there it’s the only Japanese I really know, and I have made people laugh at me regularly by speaking dialect unwittingly!). To be honest, the kindness and politeness is something I found all over Japan, but it was still great to continue to witness it in a big, busy city the size of Osaka. It’s not something I take for granted. 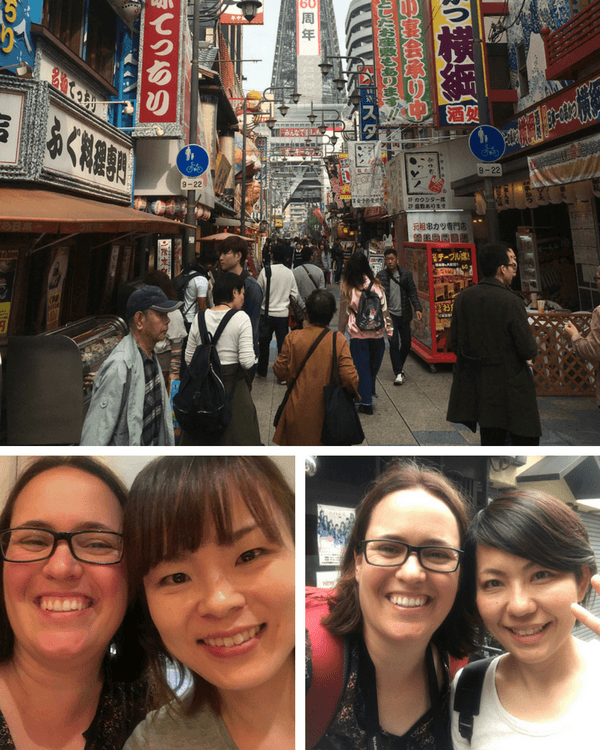 My whirlwind trip only gave me time to catch up with one of my old Osakan friends (hello, Shizuka! ), so I desperately need to return with more time to see all of them, but I was also lucky to make new friends amongst the teams of people who would spend time with us each day of our trip (like from Osaka City, hello Hiromi!). All of this means you need to travel to Osaka, Japan, NOW!, and meet the Osakan people, too. I know they’ll be friendly and help you out. Go for it – or as the Japanese would say, Gambatte! Great insight into a city I’ve not yet visited. I’ll be popping back to use these tips one day I’m sure. Japan is high on my list. Yes leave it high on your list. Amazing place. I think accessibility is a really mixed bunch there but in some areas it’s really advanced. Wow I love all your photo’s and Osaka Castle is gorgeous. I think I am going to move back to Japan just for the food LOL. Thank you so much for my omiyage I have it sitting on my desk I love it. You’re so welcome Julie. And yes moving there even just for the food is a perfectly reasonable life decision I reckon!! Thanks Korii! 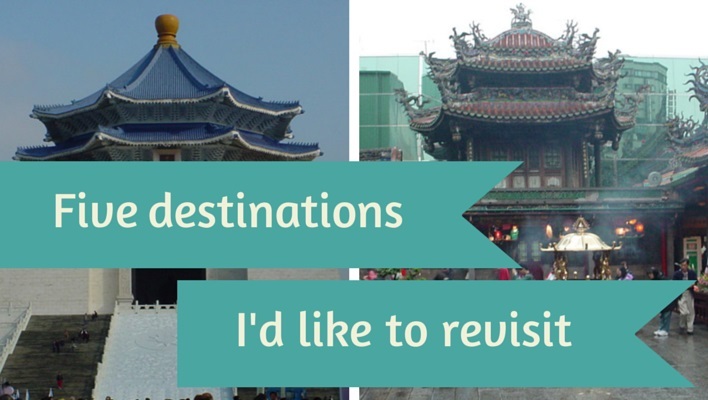 Very glad to convince you to add Osaka to the list, you won’t regret it! Oh my goodness what a great read and what memories it evokes. I love absolutely everything about Japan ( except natto lol) so this post really resonated with me. Osaka is awesome but then again I think any place in Japan is awesome. I cannot get enough of all things Japanese. The people, the food, the culture, the diversity, the scenery, the cities, the ease of travel, the quirkiness etc etc etc ….I love it all.. Hopefully I will visit again soon.. Thanks for this memory evoking post. Thanks so much Robyne! I completely agree on the natto … and also that pretty much any place in Japan is awesome. I can’t get enough of it either. It looks beautiful Amanda, I have never considered visiting Japan but I am certainly rethinking that now! Thanks Sharon – yes you definitely need to put it on the list! Fabulous place for so many reasons. I have to admit I’ve never really had a desire to visit Japan before – but you are starting to change my mind! Glad to hear it Ava and I’m going to keep working on it!! It’s such an amazing country. Awesome write up. I live close enough to Osaka but don’t get there nearly often enough. That’s gonna change in 2017! Thanks T-Ray! Yes, get back to Osaka, great city. I love your Hanshin Tigers site – I remember all my students being huge Hanshin Tigers fans when I lived in Osaka!